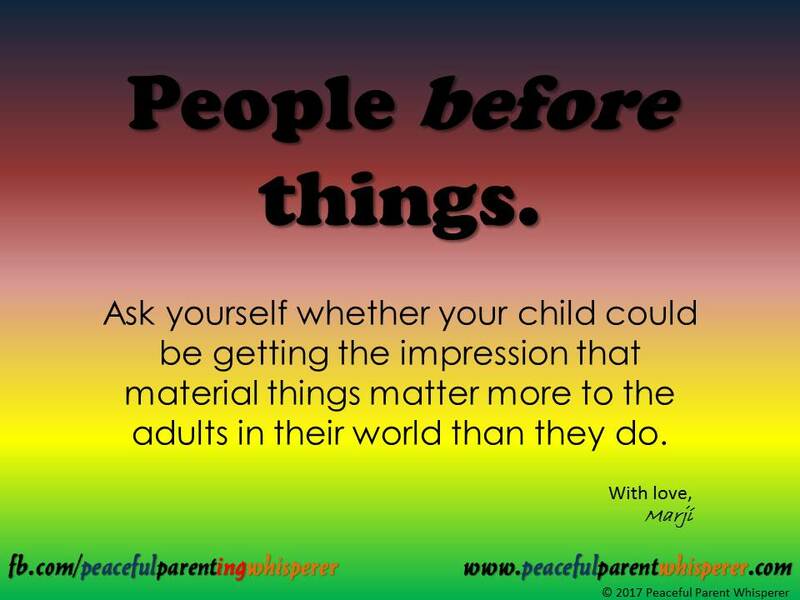 The text reads: Ask yourself whether your child could be getting the impression that material things matter more to the adults in their world than they do. Even though this is a sometimes challenging value to uphold, being mindful of this can make a WORLD of difference in your relationship with the young folks in your life!!! PeckaKucha! A Presentation About Peaceful Parenting! A brief slide presentation giving at a PechaKucha Night! A sweet mama asked a question... and I couldn't shut up. New Year's Resolution #4: Less Talking...More Listening...to Your Intuition! ...we second-guess ourselves...we allow that fear to drown out our intuition's quiet voice until we can hear it no longer; and in so doing, we allow that fear to block our own brilliance! The more we listen to the fear, the stronger it gets. Giving kids the benefit of the doubt, we see them as doing the best they can, motivated and driven to learn about their interesting world and how it works, allowing our whole approach to change! ...when we take our kids seriously, they will come to take themselves seriously! It's good to understand WHY kids lie. Of course, they're not going to be able to tell you, but when you understand what may be behind the lying, it can alter your response to it, and that can make all the difference in the world! "So, there I am at the supermarket. It's a BEAUTIFUL late summer/early autumn day. Warm, sunny, dry, fragrant air... I'm putting my groceries into the car and just enjoying everything, and I hear a shopping cart go by. I glance up, and it's one of those carts with a toy car in the front, and the little driver is taking his role very seriously. My heart goes pitter-patter as I enjoy his enjoyment." "I was spanked, and I turned out 'just fine.'" "What follows 'I am...'or 'you are...' or 'she/he is...' is a label. Labels can be very problematic and can undermine connection and happiness for a few very important reasons." Anyway, that's the news from Dreamsville, where I am apparently learning all the time! "How do you do it?" "To answer your question, I got my Master's degree in Positive Thinking from the University of Being My Kid's Mom." That Screaming Parent in the Supermarket... What to Do? Turn it Around ... using this excellent tool! Making the Switch to Peaceful Parenting Classes Available! Check it out! I help parents improve relationships with their kids, eliminating tantrums, meltdowns and poor cooperation and creating a peaceful, joyous, thriving home. To reach Marji, call her at 845-657-3111, send an email to marji @ peacefulparentwhisperer DOT com, or just click here for the contact page.